We can finally see the end of the harvest. I went out to pick tomatoes and peppers today after a couple days of rain, and discovered that some of those frosts we thought didn’t happen, did. We lost one pepper plant, and all the tomatoes except the Peche Jaune jungle are clearly dying. 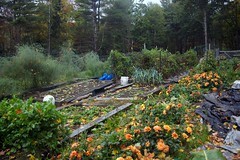 It’s time to figure out what to do with the green ones before frost makes them compost. There’s no point in hanging the plants in the basement, and no place to hang 75 of them if we did. Lisa learned at her master gardener class that the reason it took so long to get ripe tomatoes was that they were pouting because we didn’t water them well enough. That’s also what killed the pepper plants that up and died. If they get to the point of wilting, watering may not save them. Now we know. Next year we’ll run dripper-line under the plastic so we can water them consistently even in another drought. 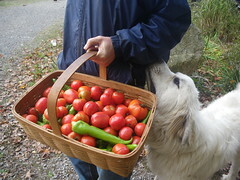 Other tidbits: Tomatoes need extra calcium in a drought. Failure to get it makes blossom end rot. Whir up some eggshells, soak them overnight and put the water on your tomatoes. Peppers will not set fruit unless it cools off at night. Ours didn’t set fruit until labor day. The okra plant is still alive, but the last two buds were frostkilled, so that’s the end of it. I left a few small cukes and jalapenos, the won’t grow in the fridge, and they might in the garden, but really they’re done too. The carrots and leeks can be harvested at any time, but there’s no hurry and they keep better in the ground, still alive. It’s time to get the sweet potatoes in. Besides we want that bed for garlic, which can go in anytime this month. The Green Mountain potatoes are still green (crazy eh? ), but I should get to them too. I pulled the last honey super (May split) today. The bee excluder had done very little, and the hive, which has way more bees than I’d expect in mid-October, made it clear that they did not approve. I left the super sitting on its side in front of the house, and as night fell, the bees were figuring out that they’d better scoot for home. I’ll bring it inside in the morning before the bees are flying. This entry was posted in Carrots, Cucumber, Garlic, Honey Bees, Okra, Peppers, Potatoes, Sweet Potatoes, Tomatoes and tagged Okra. Bookmark the permalink. Post a comment or leave a trackback: Trackback URL.